What's the best 1% colloidal oatmeal eczema lotion? 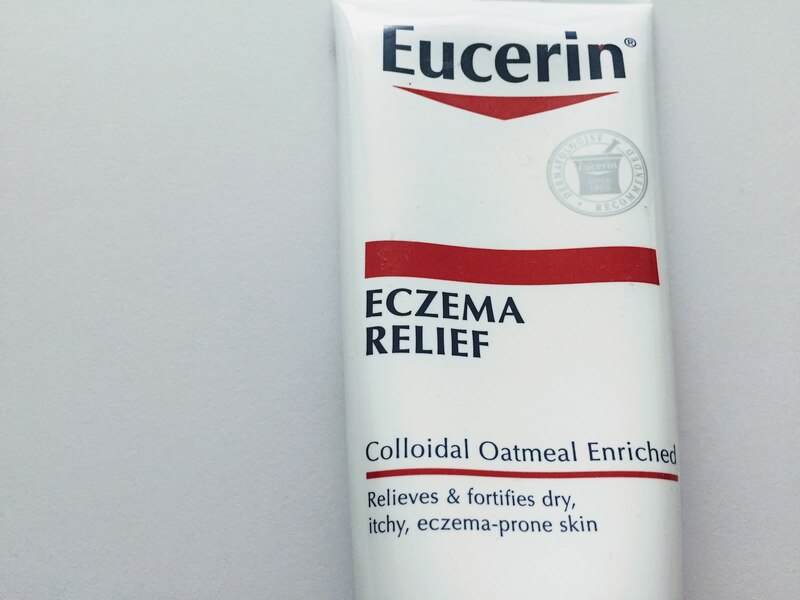 Eucerin vs. Aveeno vs. Dove: Which brand makes the best eczema lotion? Anyway, all of this is a long-winded way of saying that I might be biased when it comes to the idea of oatmeal-powered skincare products. What’s not to like? Oats don’t have an offensive scent—and they hold onto moisture really well (if you’ve ever made overnight oats, you probably know how much liquid they soak up). So I think it makes perfect sense that colloidal oatmeal is one of the most popular products in eczema lotions. However, there are several brands that are marketing eczema relief lotions with the exact same active ingredient (colloidal oatmeal) at the same concentration (1 percent). Which ones should you choose? Today, we’ll compare three mass-marketed eczema relief lotions that each list 1 percent colloidal oatmeal as the active ingredient: Dove DermaSeries Eczema Relief Body Lotion, Eucerin Eczema Relief Body Creme, and Aveeno Eczema Therapy Moisturizing Cream. Why is colloidal oatmeal used in skincare? Studies have shown that colloidal oatmeal helps soothe itchy, inflamed skin (Source). Colloidal oatmeal is regulated by the FDA as a skin protectant active ingredient; in order to be listed as an active ingredient, it must be included in a formula at a minimum 0.007 percent concentration, or 0.003 percent minimum concentration if combined with mineral oil. That’s such a low number, which leads me to think that you shouldn’t invest in a product that mentions that it includes colloidal oatmeal, but doesn’t tell you the concentration of that ingredient—it might not actually be all that much. Interesting! Read more about skin protectant active ingredients here. Three major brands (Dove, Aveeno, and Eucerin) have each developed lotions that list 1 percent colloidal oatmeal as the active ingredient. As a consumer who has mild hand eczema, it’s not immediately apparent to me which of them is the best option for me. These three products are all similarly priced, about $10 for a 7 or 8 oz. tube. Eucerin is the cheapest per ounce, with Aveeno only slightly more expensive, and Dove the priciest option of the three. Let’s take a closer look at the non-colloidal oatmeal ingredients to see which one will give you the most moisturizing bang for your buck. Active Ingredient: Colloidal Oatmeal 1.0% - Skin Protectant. Today’s dispatch comes to you through paraphrasing, since I actually talked to him on the phone about these products. Mainly he noted that all three products have the same concentration of the active ingredient (colloidal oatmeal), so they should all be pretty effective. That said, he picked product #3 (Aveeno Eczema Therapy Moisturizing Cream) as his favorite of the bunch, because he liked its other ingredients the best. He said product #2 (Eucerin Eczema Relief Body Creme) was just about as good, since it also includes a ceramide as an ingredient. He didn’t say anything about product #1 (Dove DermaSeries Eczema Relief Body Lotion). He liked #2 (Eucerin) and #3 (Aveeno) because they each include a ceramide, though it may be a very low concentration, like 0.003 percent or something. Unfortunately, we have no way of knowing how much they actually include in the formula. 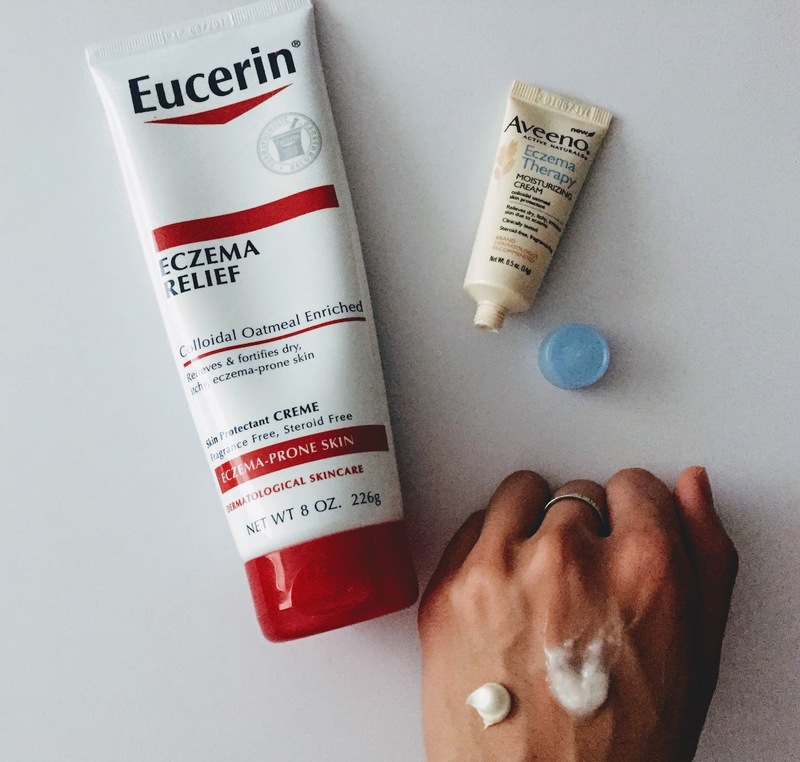 I currently use Eucerin Eczema Relief Body Creme when my hands feel extra dry (otherwise, I use Vaseline Intensive Repair lotion), but based on these thoughts, I might give Aveeno’s eczema cream a serious try. I already have a sample size of the product (can’t remember exactly where I got it). As you can see above, Aveeno’s formula is a bit more watery and less smooth than Eucerin’s. It seems a bit more “natural” and oat-like. Eucerin’s is a bit more slick and lotion-like, maybe because of the oils. Even though Aveeno’s formula contains petrolatum, it feels less oily than Eucerin’s. 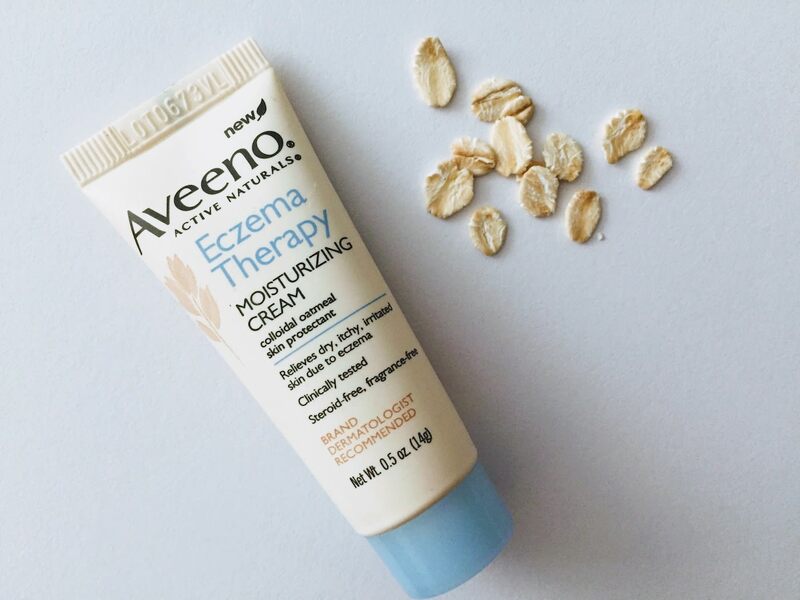 Aveeno’s formula also contains oat oil (avena sativa kernel oil), which may help improve the skin barrier function (and thus help protect the skin against inflammatory conditions like eczema), according to this study. Banana Boat Sport Cool Zone Sunscreen Review: Is this 'cooling' sunscreen as cool as it seems? What is denatured alcohol, and why is it used in personal care products?